and knowing we are not He. Originally founded as St. Joseph Academy in 1877 by the Sisters of St. Mary of Namur, St. Mary’s School has a long-standing tradition in the Grayson County community. For over seventy five years, the school existed as both an elementary and secondary school. During the last forty years, or so, the school has offered primary education for its students. In 1972, a kindergarten was added, and in 1988, a preschool. After one hundred fourteen years of dedicated service and love for their students, the Sisters of St. Mary retired from active teaching. The fall of 1991 brought forth a new era of an all lay faculty, each dedicated to continuing the excellence of education instilled by the Sisters of St. Mary of Namur. St. Mary’s offers a varied and in-depth program of learning from pre-school through 8th grade. Our curriculum includes a solid concentration in the basics: religion, English, reading, mathematics, science, and social studies. Spanish, French, music, art, and computer education round out a curriculum designed to educate the whole child. Enrichment programs, offered as early as kindergarten, provide opportunities for advanced development in the areas of mathematics and language arts. “Think Labs” address advanced concepts in the fields of social studies, science, and reference skills. “Math Labs” challenge the students and our accelerated reading program promotes advanced articulation skills. A key goal of St. Mary’s Catholic School is to help every child grow in the knowledge of God, Jesus Christ, and the Holy Spirit. Our centered environment emphasizes service, prayer, and discipline. Weekly Mass attendance enhances the children’s appreciation of the faith. St. Mary’s pre-school program follows an “early learning” curriculum developed by the Diocese of Dallas. The program provides a trusting and open atmosphere in which children can grow to their fullest potential as they develop a strong foundation intellectually, spiritually, socially, and physically. Beginning in kindergarten, weekly lessons expose our students to educational games. Then, as students progress, they are introduced to basic software systems and programming appropriate to their level of learning. Music programs are offered at all grade levels. Our annual Christmas program includes participation by all of our students and staff. Introduced to our curriculum in the 2000-2001 school year, the weekly art classes enrich the creative side of our students. Our physical education program is modeled after the President’s Physical Fitness Plan. Our goal is for all students to successfully complete the age appropriate fitness schedules by the end of the school year. St. Mary’s students are educated in a secondary language from their earliest years. Spanish is currently taught in kindergarten through 5th grade. French is taught for 6th, 7th, and 8th graders. Community Service projects are included in our religious curriculum. Students learn the virtues of kindness and mercy through visits with the elderly and projects for the needy. Early morning and after school programs are offered to students in all day pre-school through 8th grade. The extended day program does not meet on days when school is not in session. 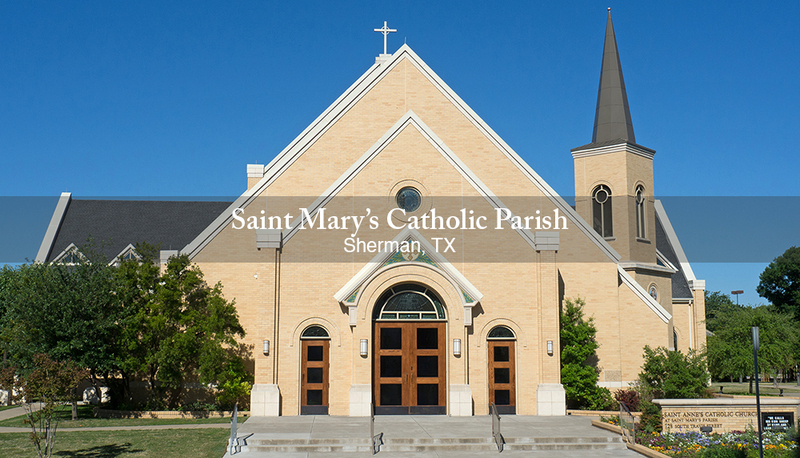 St. Mary’s Catholic School is accredited by Texas Catholic Conference and holds membership in the National Catholic Education Association and the Texas Association of Nonpublic Schools. Highly qualified professional educators staff the school, each one dedicated to the growth and development of the children entrusted to their care. St. Mary’s seeks to assist the parents in laying a firm foundation for the spiritual, intellectual, and physical development of the students. 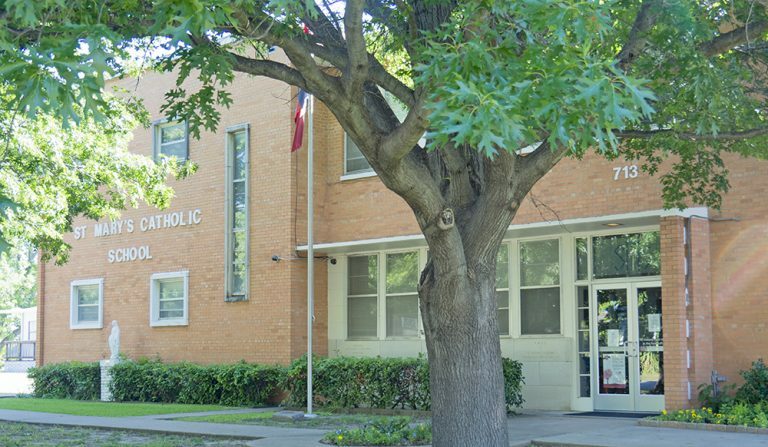 The integration of a strong academic program with religious truths and values distinguishes this Catholic school and gives St. Mary’s its uniqueness. St. Mary’s offers an excellent opportunity for children of all faiths. A combination of self-paced instruction and regular classroom structure maintain a high level of academic excellence. This challenges every pupil to reach their potential as a student of St. Mary’s Catholic School. St. Mary’s is a proud institution: proud of its rich heritage of excellence, proud of its current level of excellent academic performance, and proud of the future that can be as bright and promising as the past. We are committed to having one of the best primary schools in the nation. Will you join us? Great Service in the Past… Great Promise for the Future!